The weather is supposed to move into the nice part of spring this week, instead of the cold, rainy version we’ve been experiencing, and my thoughts are turning from warm vegetable curry to smoothies. I’m not quite ready to break out the ice, but a bit of frozen fruit does a body good. 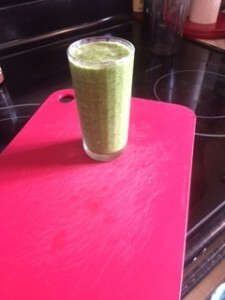 My husband and I both enjoyed this sweet smoothie yesterday during a break from eating chocolate eggs and jelly beans. This smoothie hit the spot so completely that I went out later on to buy more fruit, ready for the warm weather starting tomorrow. Blend first four ingredients for about 30 seconds in a high speed blender and divide between two cups. 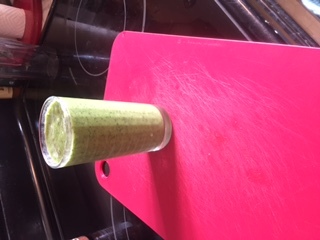 Then pour in the cold water and reblend to get some of the spinach stuck along the blender walls back into your cup, and divide that between your serving cups as well. Sweet and refreshing! This entry was posted in Smoothie and tagged Califia Farms, smoothie, spinach on March 28, 2016 by Heather.